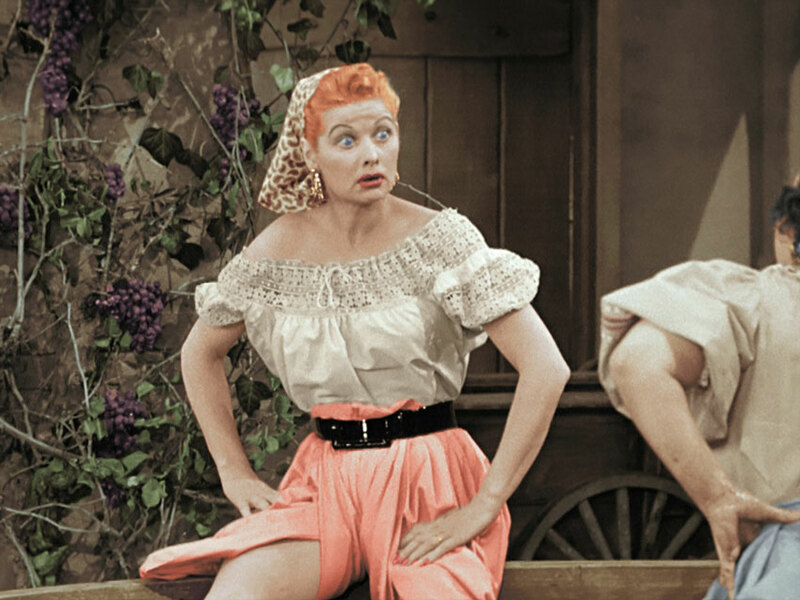 Try as she might, Lucy Ricardo (Lucille Ball) can’t steal the limelight from the real deal. Photo courtesy CBS. I’m generally not a fan of colorized versions of vintage black and white TV shows and movies. The faux colors tend to look garish and cheesy and usually flatten the rich contrast found in their original black and white counterparts. That said, I have to tip my hat to the team responsible for colorizing the I Love Lucy Christmas Special set to air on CBS tonight, Friday, December 20 (8:00-9:00 p.m., ET/PT). The I Love Lucy Christmas Special not only piggybacks as holiday fare two quite lovely and immensely entertaining colorized episodes from the landmark I Love Lucy CBS-TV series, but manages (thanks to the sensible use of color) to inject a timeless, modern-day quality to the episodes without sacrificing the vintage framing music, titles and commercial breaks. I highly recommend that even the most stubborn foes of colorization give this show a chance, especially since it features the rarely seen 1956 Christmas Episode and the much-loved 1956 “Grape-Stomping” escapade, Lucy’s Italian Movie. Fred and Ethel join the fun as Lucy and Ricky wistfully recall Lucy’s unexpected pregnancy announcement at Ricky’s club and Ricky, Fred and Ethel’s subsequent foiled effort, months later, to get Lucy to the delivery room on time. Black and white flashbacks are intercut from these classic episodes. The latter, still hilarious after all these years, continues to serve as the classic benchmark for all the memorable, if derivative, sit-com “birthing” episodes that followed. Overall, colorization works well in The Christmas Episode as it enhances quite naturally Lucy’s red hair, the Ricardos’ Christmas tree decorations, Little Ricky’s pricey gifts and the red suits worn by the five adult Santas who make Little Ricky’s Christmas dreams come true. However, in tandem with the colorized sequences, the “memories” recalled in black and white flashbacks make perfect sense as well. Lucy absorbs some local color in a vat of grapes. Photo courtesy CBS. Of course, who can forget Lucy’s Italian Movie? 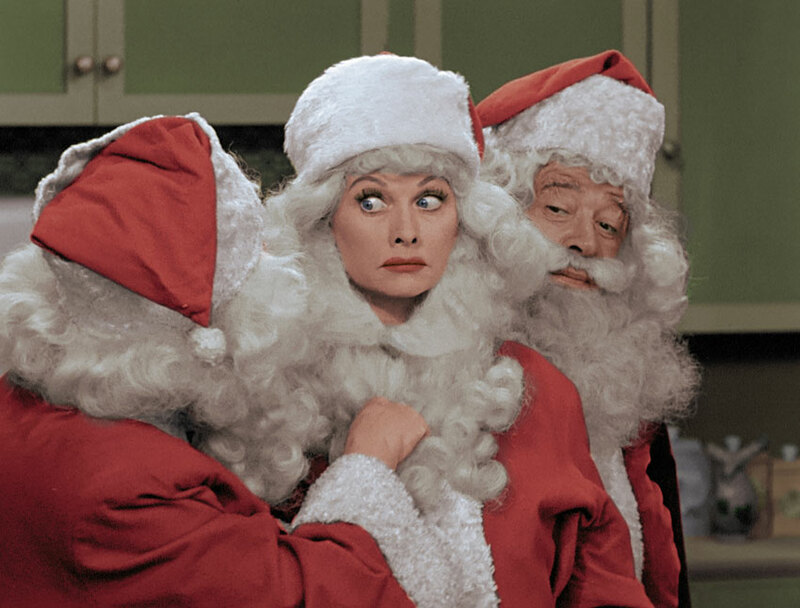 The episode originally aired in March 1956, became an instant classic and is included in its entirety in Part 2 of this I Love Lucy Christmas Special. While in Rome, in an effort to prepare for a role in an Italian movie, Lucy sets out to absorb some local color and ends up, instead, soaking up a purple hue in a tub of grapes. Lucy’s tangled red hair and grape-stained face, arms and legs look great colorized, but not to the Italian movie producer who hires Ethel for the part instead. This entry was posted in TV and tagged Classic TV Comedies, Colorization, Family Relationships, Fred and Ethel Mertz, I Love Lucy, I Love Lucy Christmas Special, Little Ricky, Lucille Ball, Lucy and Ricky Ricardo, Lucy's Christmas Episode, Lucy's Italian Movie. Bookmark the permalink. I LOVE Lucy, enjoyed your article as always! Thanks Judy. To a great new year! Color or black & white, we all loved Lucy… and still do. Have a wonderful Christmas Judy, and a happy and healthy New Year.